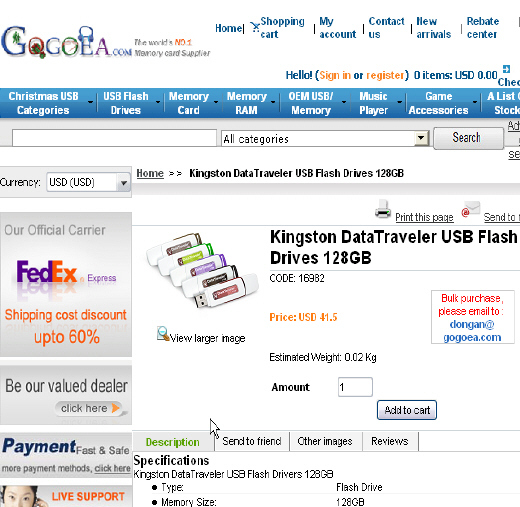 These sites all have Kingston flash drives to offer that can not be found at Kingston’s official site. If Kingston makes the drive and size you can be sure they will list it. If they don’t, watch out! You are likely to be buying a counterfeit usb flash drive. Feel free to perform your own investigation on these sites using the official Kingston site as your guide and compass to find the counterfeits out there. Free Shipping!!! Available in 5 different Colors!!! With large capacity, the sleek, practical, and attractively designed DataTraveler 110 contains room for high-definition photos, graphics-intensive documents, videos, spreadsheets, presentations, term papers, and music that can be stored and retrieved in a flash. The affordable DataTraveler 110 serves the needs of the budget-conscious user as well as those looking for significant storage capacity in a lightweight, compact design. 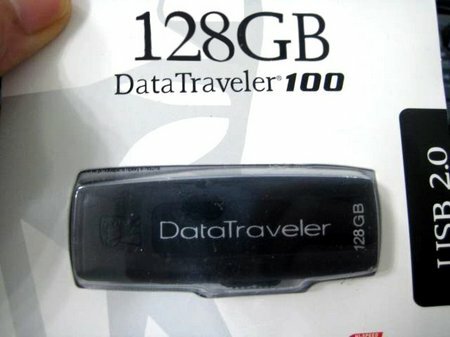 DataTraveler 110 features a retractable USB connector for ease of use and safe housing. By the way, what does Kingston have to say about the DataTraveler 110 . See for yourself. How the model does not match. Counterfeiters of brand names are doing a lot of dam mage. To the brand name and also to the buyer when they start losing data the moment they exceed the true capacity of the drive. Do not think eBay is the only place where this happens. It can be found everywhere and anywhere. If you want to buy a brand name usb flash drive on the internet. DO YOUR HOMEWORK, ALWAYS CHECK THE OFFICIAL SITE FOR A MANUFACTURER’S offerings. That is the first step in protecting yourself from a counterfeit and false capacity usb flash drive. 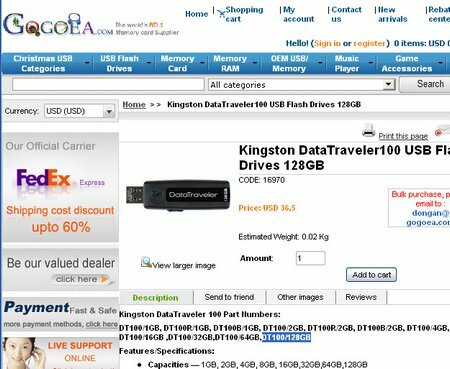 If the information presented makes you wary about buying a Kingston flash drive on the internet, you should know that Kingston also sells the drives directly. If you buy from them – you won’t have to worry about acquiring a counterfeit. From what victims of fake flash purchases have to say in hindsight? They would rather have spent more and avoided the ordeal they went through. Kingston has written the definitive document related to memory and the technology behind it. Everything you ever wanted to know about memory can be found here. A 13 page PDF document describing everything you need to know about Flash memory. Kingston has made a great effort to educate the public. You will find the information useful and interesting. This entry was posted on January 25, 2009 at 4:29	and is filed under Advice, Fake Flash Memory, Flash Drive Education, Guides Fake Memory, Internet, News, Warning. 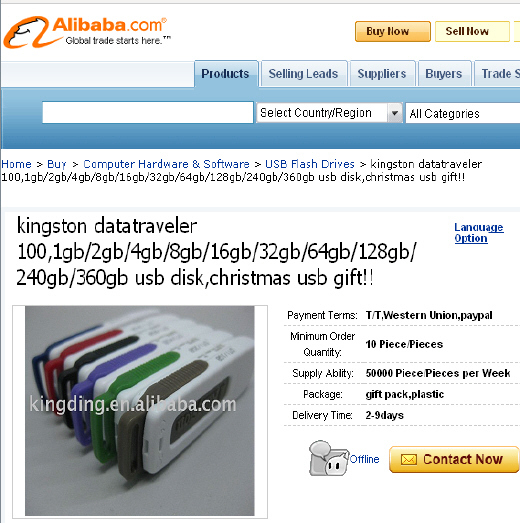 Tagged: Counterfeit Flash Drives, eBay Fake Flash Guides, Flash Drive Facts, Kingston DataTraveler, SOSFakeFlash. You can follow any responses to this entry through the RSS 2.0 feed. You can leave a response, or trackback from your own site. I purchased kingston DT of 128 GB due to viruses formated and now getting only 31 GB of space. what to do to get full space. 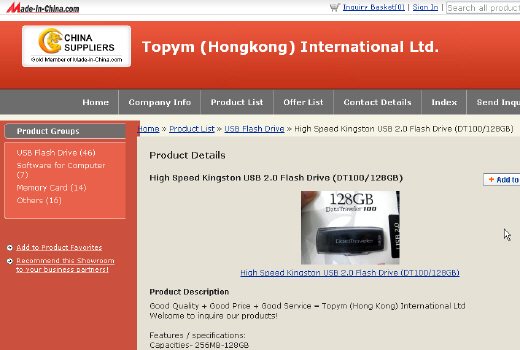 We are not aware of any DT 128GB kingston flash drive. I think the highest made right now is 64GB. Have you tested the drive with H2testw 1.4? What does it have to say? You need to find out what the real capacity of the drive is. That will let you know what you might be able to have once you find the right tool to reflash it. Oops messed up the link! I bought a 128 and 64 Gb labeled Kingston flash drives from a chinese manufacturer. I’ve read aboutthe fake flash and the ones I bought are in fact fakes. Now i need to now if someone can help me to repair them for, at least, get the real capacitiy. The controller chip is the MW6208E and the flash memory chip is labeled MLC64G081uF, so I think the real capacity is 8Gb. I used the UDtools 1.0.4.6 software to try to repair them but now both drives shows a capacity of 8Mb and no way to format them. I’ve tried to download the Chipgenius software without success, the link you put in this page does not work. Or if you have a newer version of the software mentioned above. There is no link for Chipgenius on this page. At fixfakeflash, the link exists. We see a lot of clicks for it. At times the site where it is linked, might go off line. Not sure. Best thing is to hunt the internet for it if this happens. Did you check the manual setting to make very sure the ECC was NOT Open? This is a big no no. Was MLC64G081uF written on the flash drive chip? I don’t see anything anywhere on the internet for it. Is there any company markings? Hynix? Samsung? Basically you are looking for the AMECO (newer) or Micov (older) tools. The 8MB senario can be corrected some times…if the right tool is found which will recognize the flash storage chip. If ECC was left open then the controller could be damaged from using a tool. One always should check the manual settings before clicking on the repair. If that happened you would get a download scan error. Otherwise you still have changes to repair them. Unless you can decode the chip, you have no way of being sure you have an 8GB chip of real capacity to repair. Kingston fakes are especially problematic. You should look at the fixfakeflash site – a few people wrestled with kingston fakes there. Please help Kingston Technologies to fight against the fraud and counterfeiting of their usb flash drives. They are being attacked! It is not fair! See the local website for Kingston in your country, go to support and contact them. Their support people are very helpful. They need your information so they can hunt down sites that offer fakes. If the listing is on eBay, they can force ebay to remove the sellers listings! Kingston is a proud name for nand flash memory products. It is really disgusting to see how people try to use their brand name to sell crap! Please help them! Report any fakes or counterfeits to them so they can stop the seller. “sells” technical stuff according to the site, paid 1600 USD for 13 Sony Ericsson Satio, but I got some USB Kingston 128 GB by this Chinese Company! I´m just reporting them to the police. I real company has @companyname.com/or the lands letters!! !